Take a walk. It may sound obvious, but walking is a quick and easy form of cardio that is good for muscle movement and will release endorphins as much as anything else. Taking a brief walk around your building or parking lot is a non-strenuous way to include some exercise into your day. Doing so will allow you some extra time to think (or not!) and regroup. You could even start a lunchtime walking club if you want some company! Fresh air, sunshine and a few thousand steps is a helpful way for you to fit in some brief fitness. Deep breathing exercises. While this is not “exercise” in a traditional sense, it is just as (if not more) important as anything else — and it requires more physicality than you might realize. Deep breathing exercises can help you instantly destress, and have even been shown to help improve digestion — which is convenient if you practice it around lunch. So, go outside and sit on a bench, or stand in the sun, and take a few deep breaths. Practice counting during these breath exercises (inhale for 5 seconds, exhale for 5 seconds) and see if you notice a shift. After spending all winter inside, breathing the outdoor air can really help improve your mood and health. Stretches. Stretching any part of your body — arms, legs, neck, ankles, wrists — can help you feel better and more ready to work the second half of your shift. Raise your arms over your head, do some arm circles, stretch out your calf muscles or rotate your neck from side to side. Get your muscles moving so they don’t feel so tense throughout your whole day. 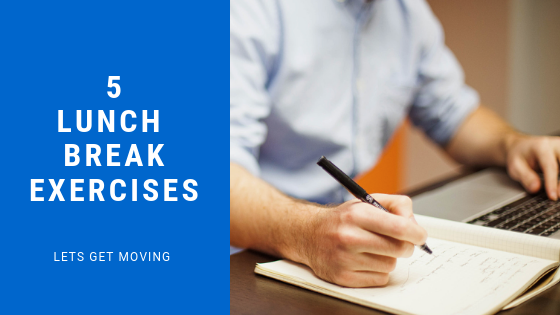 Consider setting aside even ten minutes to stretch (if the weather gets really warm, you could even sit in the grass) on your lunch break to not only feel good but to increase blood circulation and improve retention of the mind. Look up yoga basic poses and practice holding them; or bring a mat and find a place to lay in the grass. Some of this may seem unconventional, but we are sure that if you try it once, you’ll be hooked on the feeling it gives you. Jumping jacks. This brief exercise is great for your whole body and a surefire, quick way to incorporate some cardio! Jumping jacks get your heart rate up and activate muscles in your arms and legs; they stimulate your cardiovascular system while helping to alleviate stress. Doing even 15 jumping jacks followed by some brief stretching may be just the amount of movement your body doesn’t know it needs. Step-ups. Step-ups are another great way to incorporate cardio and immediately get your heart rate going. If you can find an empty bench or even a step somewhere outside, consider doing some step-ups. (They are literally the act of stepping one foot up, then the other, then stepping one foot down, and then the other.) You can do this as quickly or as slowly as you would like. This easy exercise does not require any special equipment and its perks is that it can help build muscle in your lower body. No matter what physical activity you choose to incorporate into your break, just make sure you get outside to do it!